This Aberdeen registered (A 50), steam trawler was on her way to the fishing grounds when she ran ashore in darkness on rocks on the north side of Wick Bay shortly after midnight. When the trawlers plight became known, Wick lifeboat, the City of Edinburgh and life-saving apparatus immediately set off for the scene, the lifeboat being launched at 12.30am. The crew meanwhile had tried to launch their small-boat but this was swept away with one of the deckhands, John Findlay, clinging to it. The boat turned upside down but Findlay succeeded in getting astride of the up-turned boat, from where he was rescued by Wick lifeboat. (Another account says Findlay was washed overboard by a wave before being picked up by the lifeboat). A large crowd gathered on the cliffs opposite the wreck and they shouted encouragement to the stranded men, as Coxswain Stewart brought the pitching, rolling lifeboat in as close as he could. But with rocks all around the trawler he was unable to reach her. The lifeboat was unable to get close to the wreck which was 60 yards offshore, because of heavy seas, but the lifesaving team succeeded in firing a line over the trawler and the crew, all of whom, except the skipper, were near the wheelhouse huddled together and were able to rig their end of the breeches buoy apparatus and be hauled ashore one by one. Three men were washed away and lost before they could be got ashore, but five men were brought to safety by the life-saving crew. The skipper, John Wood, had taken to the rigging of the foremast after having become cut-off from the rest of the crew by waves breaking over the stranded vessel, after having gone forward to check when the trawler first struck. As the trawler's deck was now under water he was unable to reach the breeches buoy attached to the wheelhouse, and had to climb higher out of the reach of the waves. Several more lines were fired over the vessel and a line passed over the Strathalford's aerial. The lifeboatmen picked up one end of the line and Coxswain Stewart skilfully manoeuvred the lifeboat backwards and forwards until they brought the line to within the grasp of the stranded skipper who quickly tied it round his body, cut the shore end and made his way down the rigging, before dropping into the foaming water. In the light of the searchlight his head was seen bobbing in the surf and he was pulled to safety and landed at 5.00am. He and John Findlay were taken to Wick hospital suffering from exposure. Chief Engineer, Charles Matheson, Aberdeen. Second Engineer, John B. Sievewright, 57, Aberdeen. Skipper, John Wood, 53, Aberdeen. Second Fisherman, A. Mathieson, Aberdeen. The Strathalford, one of the well known Strath Fleet, was built in 1929 by Hall Russells, for the Aberdeen Steam Trawling & Fishing Co. Ltd. Her dimensions were 117' long by 22' wide by 13' deep. She was 218 gross registered tons and she had 1 x 3 cylinder triple expansion engine, one boiler, one mast, single shaft and one screw. 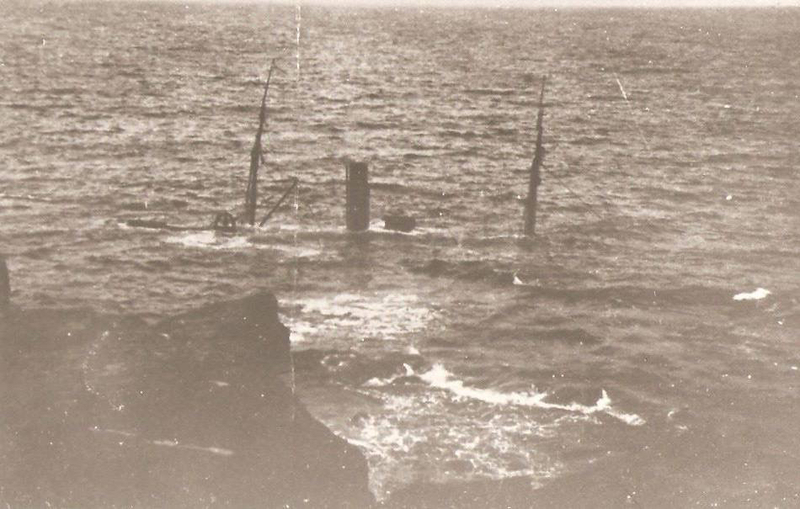 Today the wreck of the Strathalford lies completely broken up on the north side of Wick Bay. It is hoped that some underwater photos of the wreck will be added here soon. The top photograph of the Strathalford appears here courtesy of the Wick Society - Johnston Collection and the lower one courtesy of Donald McKay. The Strathalford awash in Wick Bay.